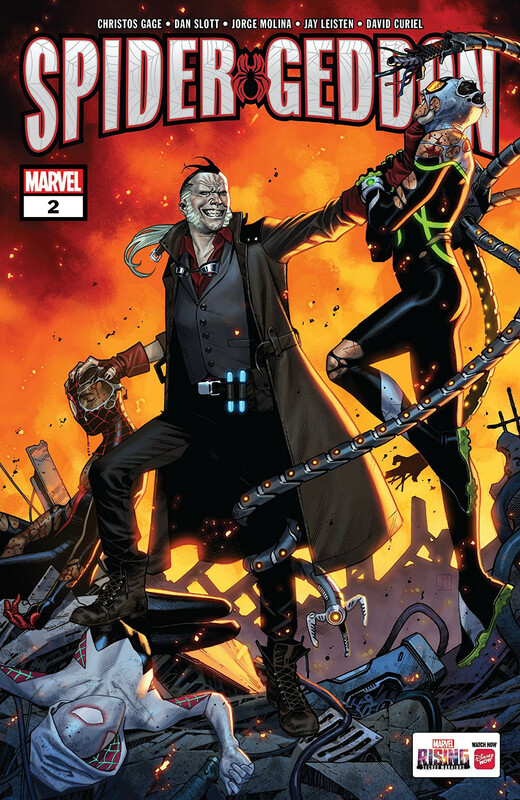 As though things weren't looking dark enough after the first issue of Spider-Geddon, the bad news train keeps rolling throughout #2. There's more death to serve up, the Inheritors post big wins, and Team Spider is looking terribly understrength. What a perfect time for everybody to split up, I say with heavy sarcasm. It's not a mortal sin, and if you are fully, fanatically invested in the event, you may even appreciate the traffic control. But it does eat a lot of page real estate out of this issue and shortchanges actual plot and character developments. Those developments are surprisingly engaging. Otto Octavius remains firmly fixed in the centre of the story. This issue is, as much as anything else, a hubris-tragedy for him. The Spiders do a lot of (well-deserved) dunking by reminding Otto that he deserves a big slice of guilt for unleashing the Inheritors again. He's dodging this realization at every turn - so far. At this point, I have high hopes that Spider-Geddon just might turn out to be the story where would-be hero Otto finally learns an important lesson re: power and responsibility. Spider-Gwen is in the runner-up slot for story attention. She's spun off toward tie-in adventures in a rational way, and this issue gives her (and her symbiote!) some much-appreciated spotlight before her departure. If the tie-in-happy nature of the plot disappoints me a little bit, some absolutely stellar art is in play to make sure that I can't judge this book as less than good. The pencils pack a lot of action into well-designed layouts. Though I'm normally leery of big art crews, the wealth of inkers working on this book translates into a wide range of finishes that suits the multi-dimensional nature of the story very well. The busy-ness of the story is further emphasized by a complex colour palette that draws from every part of the rainbow. It's a job done well; the colours go from vibrant to moody and back again without inducing whiplash. I'm glad that the Inheritors don't get too much attention. Deadly dangerous they are, yes; deeper than moustache-twirling vaudeville baddies, they are not.